This movie is not nearly as good as it deserves to be. With A-list talent both on screen and behind the scenes, this should crackle with humor and human drama. Instead, the story wanders, the unnecessary sub-plots pile up, the script struggles with the story it wants to tell. Hank Palmer (Downey Jr.) is a big-city lawyer whose billings are impressive, but whose personal life is in disarray. In the midst of a trial, he gets a call: his mother has died, he needs to return home to Carlinville, Indiana. 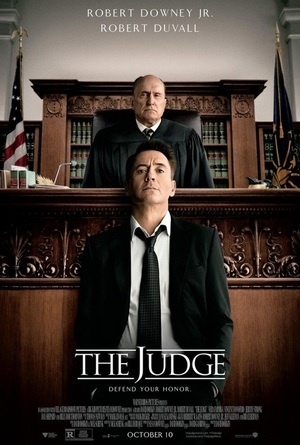 There, he’ll face his tough and estranged father, the Judge (Duvall), his two brothers and the demons his family has tried to hide in their closet. His staying opens up old wounds and inspires far too many backstories. Any of those stories could have been interesting. When they go nowhere, adding nothing to the plot, they become annoying. They pull us out of – and dilute the effectiveness of – the main story of a father and his son and a trial that could change both of their lives. This is a performers’ film and Downey Jr and Duval contribute moments when their performances outshine the script. But those moments are too scarce in a script that’s always heading somewhere else, taking us places we don’t need to go. And what we end up with is a movie that needs an editor. It’s too long, too slow, too filled with detours and distractions. It’s a comedy that’s only occasionally funny, a family-reconciliation story that’s fully predictable, a legal drama that proves unsatisfying. There are smatterings of romance, and one scene takes place in a tornado. Too much? Ya think?